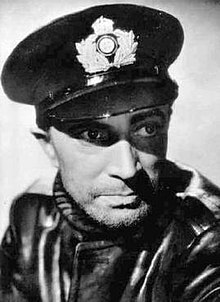 Hans Walter Conrad Veidt (/faɪt/; 22 January 1893 – 3 April 1943) was a German actor best remembered for his roles in films such as Different from the Others (1919), The Cabinet of Dr. Caligari (1920), and The Man Who Laughs (1928). After a successful career in German silent films, where he was one of the best-paid stars of Ufa, he and his new Jewish wife Ilona Prager were forced to leave Germany in 1933 after the Nazis came to power. They settled in Britain, where he participated in a number of films, including The Thief of Bagdad (1940), before emigrating to the United States around 1941, which led to him having the role of Major Strasser in Casablanca (1942). Veidt was born in a bourgeois district of Berlin, in what was then the German Empire, to Amalie Marie (née Gohtz) and Phillip Heinrich Veidt. (Some biographies wrongly state that he was born in Potsdam, probably on the basis of an early claim on his part.) His family was Lutheran. In 1914, Veidt met actress Lucie Mannheim, with whom he began a relationship. Later in the year Veidt was conscripted into the German Army during World War I. In 1915, he was sent to the Eastern Front as a non-commissioned officer and took part in the Battle of Warsaw. He contracted jaundice and pneumonia, and had to be evacuated to a hospital on the Baltic Sea. While recuperating, he received a letter from Mannheim telling him that she had found work at a theatre in Libau. Intrigued, Veidt applied for the theatre as well. As his condition had not improved, the army allowed him to join the theatre so that he could entertain the troops. While performing at the theatre, he ended his relationship with Mannheim. In late 1916, he was re-examined by the Army and deemed unfit for service; he was given a full discharge in January 1917. Veidt returned to Berlin to pursue his acting career. From 1916 until his death, Veidt appeared in more than 100 films. One of his earliest performances was as the murderous somnambulist Cesare in director Robert Wiene's The Cabinet of Dr. Caligari (1920), a classic of German Expressionist cinema, with Werner Krauss and Lil Dagover. His starring role in The Man Who Laughs (1928), as a disfigured circus performer whose face is cut into a permanent grin, provided the (visual) inspiration for the Batman villain the Joker, created in 1940 by Bill Finger. Veidt also starred in other silent horror films such as The Hands of Orlac (1924), another film directed by Robert Wiene, The Student of Prague (1926) and Waxworks (1924) in which he played Ivan the Terrible. Painting of Conrad Veidt by Milena Pavlović-Barili, the most notable female artist of Serbian modernism. Veidt also appeared in Magnus Hirschfeld's film Anders als die Andern (Different from the Others, 1919), one of the earliest films to sympathetically portray homosexuality, although the characters in it do not end up happily. He had a leading role in Germany's first talking picture, Das Land ohne Frauen (Land Without Women, 1929). He moved to Hollywood in the late 1920s and made a few films, but the advent of talking pictures and his difficulty with speaking English led him to return to Germany. During this period, he lent his expertise to tutoring aspiring performers, one of whom was the later American character actress Lisa Golm. Veidt fervently opposed the Nazi regime and donated a major portion of his personal fortune to Britain to assist in the war effort. Soon after the Nazi Party took power in Germany, by March 1933, Joseph Goebbels was purging the film industry of anti-Nazi sympathizers and Jews, and so in 1933, a week after Veidt's marriage to Ilona Prager, a Jewish woman, the couple emigrated to Britain before any action could be taken against either of them. Goebbels had imposed a "racial questionnaire" in which everyone employed in the German film industry had to declare their "race" to continue to work. When Veidt was filling in the questionnaire, he answered the question about what his Rasse (race) was by writing that he was a Jude (Jew). Veidt was not Jewish, but his wife was Jewish, and Veidt would not renounce the woman he loved. Additionally, Veidt, who was opposed to anti-Semitism, wanted to show solidarity with the German Jewish community, who were rapidly being stripped of their rights as German citizens in the spring of 1933. As one of Germany's most popular actors, Veidt had already been informed that if he was prepared to divorce his wife and declare his support for the new regime, he could continue to act in Germany. Several other leading actors who had been opposed to the Nazis before 1933 switched allegiances. In answering the questionnaire by stating he was a Jew, Veidt rendered himself unemployable in Germany, but stated this sacrifice was worth it as there was nothing in the world that would compel him to break with his wife. Upon hearing about what Veidt had done, Goebbels remarked that he would never act in Germany again. After arriving in Britain, he perfected his English and starred in the title role of the original anti-Nazi version of Lion Feuchtwanger's novel, Jew Süss (1934) directed by German-born US director Lothar Mendes and produced by Michael Balcon for Gaumont-British. He became a British citizen by 1938. By this point multi-lingual, Veidt made films in both French with expatriate French directors and in English, including three of his best-known roles for British director Michael Powell in The Spy in Black (1939), Contraband (1940) and The Thief of Bagdad (1940). By 1941, he and Ilona had moved to Hollywood to assist in the British effort in making American films that might persuade the then-neutral and still isolationist US to join the war against the Nazis, who had conquered all of continental Europe and were bombing the United Kingdom at the time. Before leaving the United Kingdom, Veidt gave his life savings to the British government to help finance the war effort. Realizing that Hollywood would most likely typecast him in Nazi roles, he had his contract mandate that they must always be villains. He starred in a few films, such as George Cukor's A Woman's Face (1941) where he received billing just under Joan Crawford's and Nazi Agent (1942), in which he had a dual role as both an aristocratic German Nazi spy and as the man's twin brother, an anti-Nazi American. His best-known Hollywood role was as the sinister Major Heinrich Strasser in Casablanca (1942), a film which was written and began pre-production before the United States entered World War II. Conrad Veidt married three times: he first married Augusta Holl, a cabaret entertainer known as "Gussy", on 18 June 1918. They divorced four years later. Gussy later married German actor Emil Jannings. Veidt's second wife Felicitas Radke was from an aristocratic German family; they married in 1923. Their daughter, Vera Viola Maria, called Viola, was born on 10 August 1925. He last married Ilona Prager, a Hungarian Jew called Lily, in 1933; they were together until his death. ^ a b Allen, Jarry. Conrad Veidt: from Caligari to Casablanca. boxwood. p. 5. ISBN 978-0940168046. ^ "Conrad Veidt: Cinema's Dark Prince, 1893–1943". Monster Zine. October – December 2000. Archived from the original on 7 February 2005. 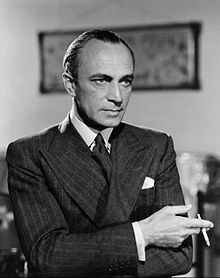 ^ a b c d "Meet Conrad Veidt, Badass". Badass Digest. 9 July 2013. ^ a b c Hull, David Stewart Film in the Third Reich, New York: Simon & Schuster, 1973 page 90. Wikimedia Commons has media related to Conrad Veidt. Robert Wiene was a film director of the German silent cinema. He is particularly known for directing the German silent film The Cabinet of Dr. Caligari and a succession of other expressionist films. Wiene also directed a variety of other films of varying styles and genres. Following the Nazi rise to power in Germany, Wiene, who was of Jewish descent, fled into exile. Friedrich Rudolf Klein-Rogge was a German film actor. Klein-Rogge is known for playing sinister figures in films in the 1920s and 1930s as well as being a main-stay in director Fritz Lang's Weimar-era films. He is probably best known in popular culture, particularly to English-speaking audiences, for playing the archetypal mad scientist role of C. A. Rotwang in Lang's Metropolis and as the criminal genius Doctor Mabuse. Conrad Wiene was an actor, screenwriter, film producer and director of Austrian and German silent film. He was a younger brother of German film director Robert Wiene. Ilka Grüning was born in Vienna in the old Austrian-Hungarian Empire. She was one of many Jewish actors and actresses that were forced to flee Europe when the Nazis came to power in 1933. A respected and famous actress in Germany, she was forced to play bit parts in Hollywood. The Hands of Orlac is a 1924 Austrian silent horror film directed by Robert Wiene and starring Conrad Veidt, Alexandra Sorina and Fritz Kortner. The film's plot is based on the story Les Mains d'Orlac by Maurice Renard. Wiene had made his name as a director of Expressionist films such as The Cabinet of Dr. Caligari and in The Hands of Orlac combined expressionist motifs with more naturalistic visuals. The film has been remade twice. Lil Dagover was a German stage, film and television actress whose career spanned between 1913 and 1979. She was one of the most popular and recognized film actresses in the Weimar Republic. Heinrich Schroth was a German stage and film actor. Margarete [Margarethe Elisabeth Sylva] Schlegel was a German theatre/film actress and soprano operetta singer active in Germany between 1919-1933 and on British radio between 1935-1955. Johannes Riemann was a German actor and film director. Riemann was a member of the Nazi Party. Felix Basch (1885–1944) was an Austrian actor, screenwriter and film director. Hans Adalbert Schlettow was a German film actor. Schlettow appeared in around a hundred and sixty films during his career, the majority during the silent era. Among his best-known film roles was Hagen von Tronje in Fritz Lang's film classic Die Nibelungen (1924). In 1929 he starred in the British director Anthony Asquith's film A Cottage on Dartmoor. Curt Courant was a German cinematographer who worked on over a hundred films during the silent and early sound eras. Courant worked in several European countries, collaborating with figures such as Alfred Hitchcock and Fritz Lang. As he was of Jewish ancestry, Courant was forced to leave Germany in 1933 and go into exile following the Nazi takeover of power. Courant worked at several of the leading British studios during the mid-1930s. He is the father of Willy Kurant who also became a cinematographer.